We’ve been big fans of Leptoseris corals for a long time, especially those of the neon orange variety. But there’s one color morph that cranks that love affair up to a whole new level. Called the Jack O’Lantern Leptoseris, this coral has the typical glowing orange body that shines under basically all spectra of lighting, but it’s the eyes that push this coral’s look way over the top. Contrasting sharply with the orange body, the neon on green eyes draw you in almost hypnotically, making it a highly sought after piece that commands a lofty price. We first encountered this coral at the Jason Fox booth at NextWave 2011, where it had the insanely high price tag of $1000 for a frag that was probably under an inch across. Fortunately, this coral has propagated through the industry, with the latest offering coming from The Coral Kings (formerly named Roc Citi Coralz). Recently displayed on their Reef2Reef forum, we’re happy to report that the price has dropped significantly. 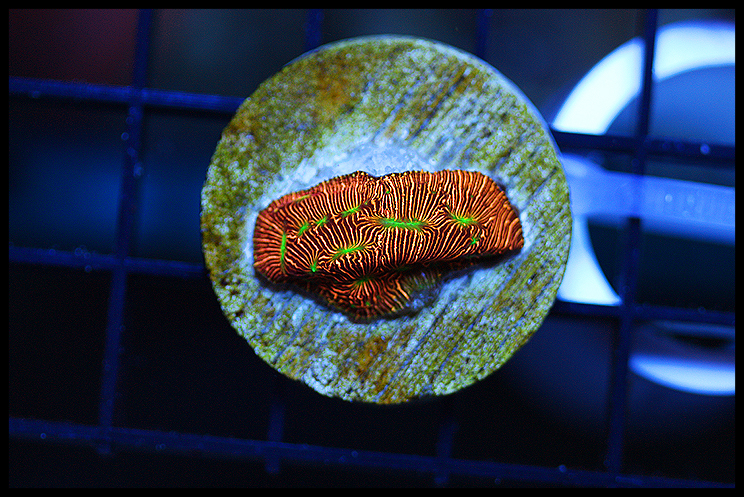 Instead of having to drop a full grand on a frag, hobbyists can now get this coral for $400 for a decent sized frag. Yes, that’s still a bit pricey, but a lot easier to digest than its previous going rate. The Coral Kings have at least three frags available, ranging in price from $275 to $400.